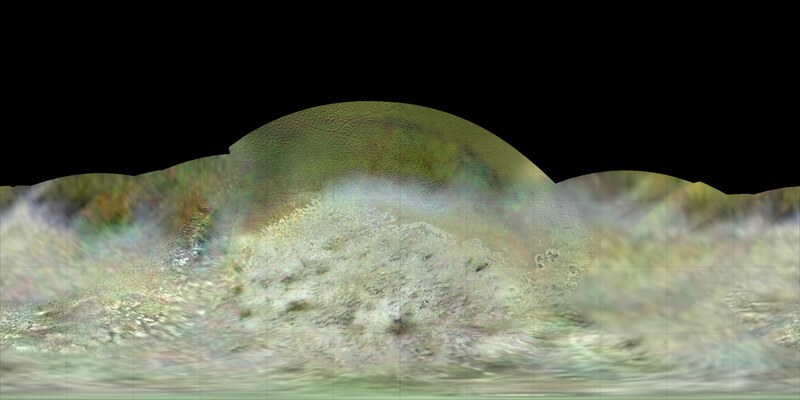 The Lunar and Planetary Institute used Voyager’s 1989 historic footage of Neptune’s moon Triton to construct the best-ever global color map of the strange moon. NASA’s Voyager 2 spacecraft gave humanity its first glimpse of Neptune and its moon Triton in the summer of 1989. Like an old film, Voyager’s historic footage of Triton has been “restored” and used to construct the best-ever global color map of that strange moon. The map, produced by Paul Schenk, a scientist at the Lunar and Planetary Institute in Houston, has also been used to make a movie recreating that historic Voyager encounter, which took place 25 years ago, on August 25, 1989. Although a fast flyby, New Horizons’ Pluto encounter on July 14, 2015, will not be a replay of Voyager but more of a sequel and a reboot, with a new and more technologically advanced spacecraft and, more importantly, a new cast of characters. Those characters are Pluto and its family of five known moons, all of which will be seen up close for the first time next summer. In another historic milestone for the Voyager mission, August 25 also marks the two-year anniversary of Voyager 1 reaching interstellar space. The Voyager mission is managed by NASA’s Jet Propulsion Laboratory, in Pasadena, California, for NASA’s Science Mission Directorate at NASA Headquarters in Washington. Caltech manages JPL for NASA. The Johns Hopkins University Applied Physics Laboratory in Laurel, Maryland, manages the New Horizons mission for NASA’s SMD. 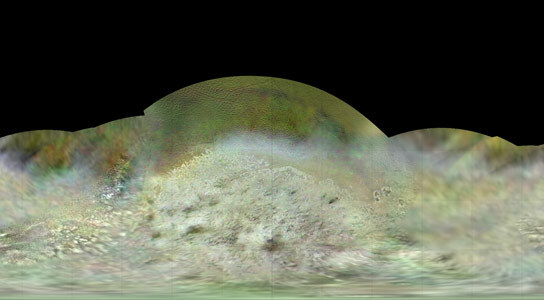 Be the first to comment on "New Color Map of Neptune’s Moon Triton"